Readers experience DRM– digital rights management– everyday, as a feature of the software they use and the entertainment they consume; it turns out that one doesn’t buy the services and experiences one thinks one’s buying; one rents them– on restrictive terms specified by the provider. Those providers take their rules very seriously indeed: they monitor their customer’s behavior for transgressions, sue their customers whenever they suspect a violation (c.f., here and here, for instance), and work surreptitiously with governments to extend their controls abroad (e.g., here). Their success-to-date hasn’t gone unnoticed by those selling atoms as opposed to bits. Monsanto, for example, patents its seeds and licenses them to farmers, so that those farmers can’t use the seeds from their crops to replant– as for centuries they have– they must repurchase (or relicense). And like the litigious software and entertainment giants, Monsanto aggressively protects its interest through law suits. 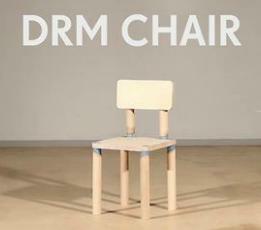 The DRM Chair has only a limited number of use before it self-destructs. The number of use was set to 8, so everyone could sit down and enjoy a single time the chair. 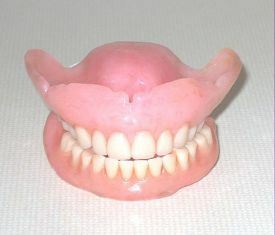 As we decide to stand up, we might recall that, while dentures date back (at least) to the Etruscans circa 700 BCE, it was on this date in 1822 that Charles M. Graham of New York City received the first US patent for artificial teeth.